October 30, 2018. 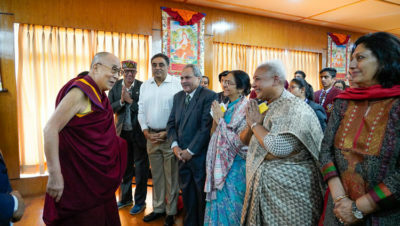 Thekchen Chöling, Dharamsala, HP, India – Today, 140 Indian students and their teachers from 14 High Schools in India and abroad came to meet His Holiness the Dalai Lama. They were all attending a Round Square conference at Him Academy Public School, Hamirpur. Once His Holiness had entered the room and wished everyone, “Good morning,” a girl student eloquently introduced the group to him. She told him that it was a great privilege for the Him Academy to host the Round Square conference and that being able to come and meet His Holiness made it even more auspicious. The co-ordinator of the conference thanked His Holiness for meeting them. He explained that Round Square is an international network of 200 like-minded schools in 50 countries that follow the ideas of Kurt Hahn, the founder of Gordonstoun School in Scotland. Round Square schools share a commitment to six themes: international understanding, democracy, environmental stewardship, adventure, leadership and service. These themes are underpinned by other qualities including compassion, tolerance and self-discipline. He explained that the focus of the present conference was co-existence. “These days I describe myself as a messenger of ancient Indian thought,” His Holiness began. “Physically I’m a Tibetan, but since childhood I’ve studied philosophy, logic and psychology in the Nalanda Tradition. The great scholars of Nalanda University are our teachers and their writings are our textbooks. So, from that point of view, I’m more Indian than many of you who follow an education system set out by the British. I believe that ancient Indian knowledge of the workings of the mind and emotions remains relevant in today’s troubled world. “We all want happiness rather than suffering, but we face a heap of problems like the gap between rich and poor that we have created. “Scientists report evidence that basic human nature is compassionate. It’s also true that we are physically, mentally and emotionally the same. Our mothers gave birth to us and treated us with great affection. And yet, as we grow up, we neglect our basic human values and become increasingly intent on money, power and reputation. We seek to destroy our enemies if we can. Even religion, which is supposed to give us guidance, can become a source of division. “But, look at India. All the world’s major religions flourish here. Various traditions of Hinduism have grown from the early Samkhyas, then there are Jainism and Buddhism, all indigenous traditions. Later, Judaism, Christianity, Islam and Zoroastrianism came from abroad. All these traditions live here in harmony, which is wonderful. “For more than 3000 years there has been investigation of the mind and emotions in India. Techniques for calming and focusing the mind as well as developing insight (shamatha and vipashyana) have been used to tackle emotions. The Buddha was a product of such traditions. Wherever I go I speak about peace of mind. To achieve that prayer can be useful, but much more effective is analysis. His Holiness went on to explain that as a human being, one of the 7 billion human beings alive today, he is committed to sharing with others how to achieve peace of mind. He said that he is also committed to protecting the natural environment. He mentioned that after receiving political asylum in India in 1959 and spending a year at Birla House in Mussoorie he moved to Swarag Ashram here in Dharamsala. That first winter, he recalled, there was very heavy snow, but year by year since then there has steadily been less. This, he asserted, is clear evidence of global warming. It is serious, because Tibet, the source of the Brahmaputra, Ganges and Indus, is the supplier of water to North India and snowfall has been steadily reducing there too. He warned that this likely to lead in the future to a real scarcity of water. His Holiness noted that he is also committed to fostering inter-religious harmony. He added that as a Tibetan and Dalai Lama the people of Tibet place their trust and hopes in him so he has a responsibility to do what he can to look after them. Following his retirement from political responsibility in 2001, he has dedicated himself to alerting people to the need to protect Tibetan ecology and preserve Tibetan culture. “We have kept the ancient knowledge we received from India alive for more than a thousand years,” he declared. “We’ve done this through rigorous study, memorizing texts, having them explained word by word and exercising our understanding through debate. The great Nalanda scholar Shantarakshita, who established Buddhism in Tibet, advised the Tibetan Emperor to have Buddhist literature translated mostly from Sanskrit into Tibetan. Consequently, our scriptural collection consists of more than 300 volumes. “In a world facing an emotional crisis, I am convinced there is much in ancient Indian knowledge that is still relevant today. Analysis reveals that destructive emotions have no sound basis, whereas constructive emotions like compassion do. An American psychiatrist who treated people overwhelmed by anger told me that they would regard the object of their rage as entirely negative, but this was 90% mental projection. I believe that if Indians could revive the ancient understanding of the workings of the mind and emotions that originated here and combine it with modern education, there would be an opportunity to enjoy material development and peace of mind. In his answers to students’ questions His Holiness remarked that people regard a show of force as heroic and engaging in dialogue as somehow weak—this needs to change. Similarly, we need to drop the tendency to view others in terms of ‘us’ and ‘them’. He noted that problems like widespread unemployment and the gap between rich and poor occur because of a lack of moral principles. He remarked that discrimination on the basis of caste is out of date and he looks forward to hearing other spiritual leaders speak out about it. He suggested that one way to address divisions in society is to take a broader view. With regard to protecting the environment His Holiness emphasized the need to take steady action, citing the example of rivers in which the presence of fish was restored by steady effort to eliminate pollution. Asked about desire His Holiness remarked that realistic desire can be positive and a source of progress. It’s unrealistic desire that leads to trouble. He advised that whatever we do we need to combine compassion and a concern for others with intelligence. That, he said, is the wise way to fulfil your own self-interest. He reiterated that just because understanding of the mind and emotions is found in texts of a spiritual nature doesn’t mean that such understanding cannot be examined and employed in an academic and scientific way. Answering an enquiry about how to reduce anger His Holiness recommended asking yourself what use anger is to you. Generally it’s destructive, creates unhappiness and clouds our ability to use our intelligence properly. Asked about co-existence His Holiness acknowledged that the global economy has made us all more interdependent, while technology has put us in closer touch with each other. At the same time, climate change and damage to the environment are presenting problems that we can only address together as members of one human community. Therefore, seeking co-existence is a natural response to the situation in which we find ourselves, but he conceded that self-centredness continues to be obstructive. With respect to positive change, education is the key factor. His Holiness emphasized once again the importance of considering how to train future generations to be more compassionate and to use their intelligence properly. A representative of the Round Square conference expressed thanks to His Holiness for sparing the time to interact with the students. He replied that he was happy to have been able to do so, because meeting with young people like this makes him feel younger too.